Bring your garden up to a whole new level! Our 2' x 2' elevated bed is easy to plant, tend and harvest without kneeling or bending. Plus, it offers creative landscaping opportunities. Set up one or more of these beds around the edge of your patio to add privacy, or as corners in combination with our 2' x 8' beds to create a garden "room". 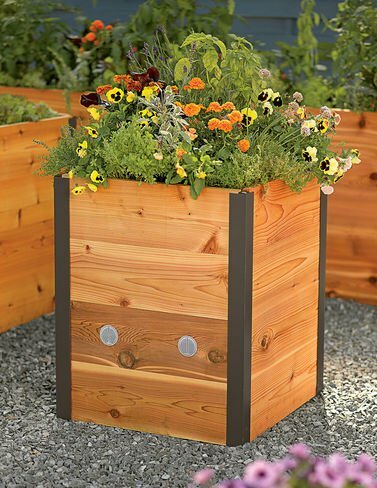 Like our other cedar raised beds, the sides are held in place with our sleek and sturdy aluminum corners. There's a false floor made from cedar planks set 10" down from the top so there's plenty of root space for vegetables and flowers. Excess water drains through slats; vents in the sides allow air to circulate and excess moisture to evaporate.